The traditional theoretical price demand curve is often drawn like this. The chart makes two points: there is some relationship between price and demand / revenue opportunity, and customer segments underpin that relationship. Each segment demands different products to satisfy different needs and presents a different revenue/profit opportunity. Even if the details are very hazy, price demand curves are useful tools to inform product strategy and prioritization. To make PD curves useful requires marketing research. It means identifying customer segments, estimating the the demand of each segment, quantifying the investment required to build the right product, and uncovering the costs of acquiring and servicing customers within that segment. After all that, there’s also a process of testing various price points to get a better sense of price elasticity. All of these are useful in the process of establishing product market fit. In most cases, the demand curve is not a straight line. Sometimes the demand curve can be parabolic. Sometimes it has kinks. Sometimes the curve comprises ten segments and other times just three. Let’s look at a sketch of a freemium demand curve. Expensify initially offered a free product. Faced with skepticism from customers about the trustworthiness of entirely free product, Expensify launched a $5 pricing plan and then the demand for the product grew substantially. By establishing even a very modest price, Expensify engendered trust and credibility with its customers, who became willing to submit credit card details, shifting the demand curve and creating a revenue opportunity. Expensify’s example highlights another important point: demand curves aren’t static. They change with the introduction of new features, sales efforts in educating the market and entry of competitors, among other factors. Below is a hypothetical SaaS company’s price/demand curve evolving over time. The company begins with an SMB focused product which elicits no demand from Enterprise customers. 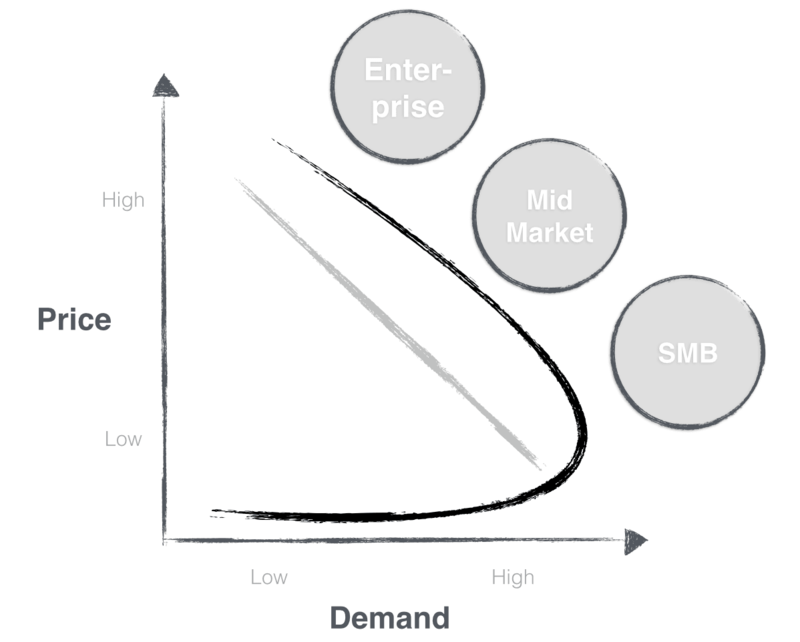 After launching a management product with single-sign on features, auditing and other features desired by the enterprise market, the demand curve matures to the one on the right. 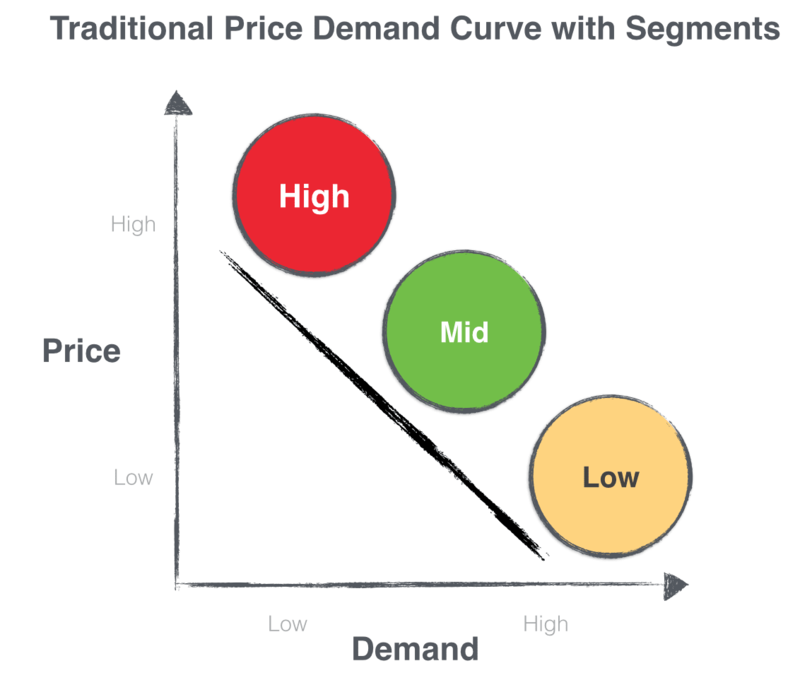 Price/demand curves are very simple models of customer ecosystem, but they are good frameworks for discussing a startup’s product evolution, particularly in more established markets. With a little bit of work, they can be used to compare the revenue opportunities afforded by different customer segments and answer the question of which product/feature does the company build next.